People with dust and pollen allergy find it hard to move around different places. There is always a fear of their allergy being triggered and them landing into a difficult situation. A variety of respirators are available in the market, if you are looking for an ideal respirator to cater your multiple needs, 3M Particulate Respirator 8210 Plus is the best choice for you. 3M particulate respirator 8210Plus, with its staple free attachment points and braided headbands, give a very comfortable experience to the user and is really easy on pocket due to its low price. Read on to know its different features and why this product is a must-have. The respirator has staple free attachment points that gives the user of this product an ease and comfort when they wear it. Plastic headbands are more likely to break at unexpected times, hence the durability factor is low. 3M Particulate Respirator 8210 Plus has braided headbands making it much more tough to break and enhance its longevity. Particulate Respirator 8210 Plus by 3M is very efficient against non-oil based particles like dust, pollen, smoke, and grass etc. NIOSH has approved for its 95% efficiency. The enhanced efficiency of its filter makes it even more reliable and preferable than the other respirators available in the market. A common problem with many other respirators that users felt was their uncomfortable fit. Respirators, if not fit perfectly on your face, can lead to fogging of eyewear hence causing difficulty of vision. 3M Particulate Respirator 8210 Plus is designed in such a way that it completely fits on your face through adjustable noseclips. The adjustability factor minimizes the risk of fogging your eyewear. With the use of this product, you will not have any problem with while driving if you are wearing spectacles. The fabric is lightweight and causes no irritation making it absolutely comfortable and easy to wear. Even if it is worn for a longer period of time, it won’t be a cause of irritation or discomfort. 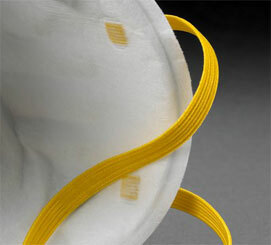 Microfibers of Particulate Respirator 8210 by 3M are charged with advanced electrostatic and patented fiber media. They enhances the comfort for the user and causes ease in breathing. Unlike other respirators, the product features some of the best characteristics you will find in the market. Let’s have a look at some of the pros of this respirator. 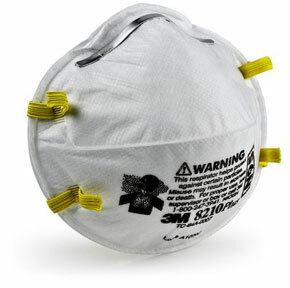 3M Particulate Respirator 8210 Plus is durable and long lasting owing to its high-quality fiber and braided headbands. The respirator can serve for a longer period of time than the others making it much more preferable. The braided headbands and its perfect fit make it easy to wear for the user without causing any discomfort. Workers can wear this respirator for ease in breathing under tough conditions for an enhanced period at a stretch without any exasperation. Inhaling hazardous carbons or other elements in the air may prove to be dangerous to you. 3M Particulate Respirator 8210 Plus has been tested and approved by National Institute for Occupational Safety and Health (NOISH) as safe for use and its efficiency. The approval serves as a testimony of its competence and superior quality. 3M Particulate Respirator 8210 Plus is highly resistant to non-oil based particles making it the most efficient respirator. As per NOISH, it is 95% efficient against the hazardous particles. A respirator is of no use if it doesn’t provide require resistance. However, Particulate Respirator 8210 Plus has proved to be the most efficient and durable respirator among the various respirators available in the market. 3M Particulate Respirator 8210 Plus comes at a very reasonable price. A number of other respirators are available in the market, but the features of 3M Particulate Respirator 8210 Plus that you get at the unmatchable rates definitely make it the best among the rest. 3M Particulate Respirator 8210 Plus is extremely comfortable to use as it can be adjusted on your face easily without suffocating you. Other respirators often cause irritation when they are worn for some time. This is not the case with 3M Particulate Respirator 8210 Plus. The quality fiber along with the perfect fit give the user the most comfortable experience. 3M Particulate Respirator 8210 Plus proves to be a great filter for blocking non-oil components making it very useful in doing different chores. However, the limitation of filtering of only non-oil components hinders its usefulness to a certain extent. Going through the detailed product description, I can safely conclude that the product is a must-have for everyone. You don’t necessarily have to suffer from some kind of allergy to use this product, you can use 3M Particulate Respirator 8210 Plus for doing your regular chores like cleaning, dusting and mowing your garden. The product is available at the most reasonable rates. The respirator is also appropriate to use if you are riding a bike. It helps in blocking the contaminated elements through its high-quality fiber and provides ease in breathing.